Cake balls are a fun dessert to make as well as eat. This page contains white chocolate cake ball recipes. These are easy to make and so delicious. Would be great for Valentine's day or any special occasion. Make cake mix according to directions and bake in a 350 degree F oven in a 9x13 pan. When completely cooled, crumble cake in a large bowl, beat until fine crumbs. Beat in 3/4 cup of the cream cheese frosting. Chill in freezer about 15 min and then roll into 1 1/2 balls. 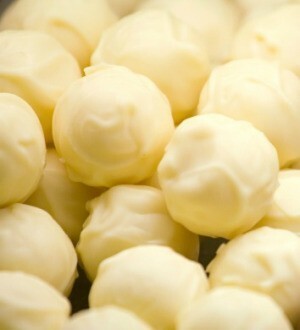 Dip the strawberry balls into the melted white chocolate, and then place on waxed paper and chill in the refrigerator. Remove from refrigerator and serve at room temp. ENJOY, they are really good.